Year 2 of EZA is starting, and I've been thinking for a while now already that it'd be great to every now and then bring up some great stuff that happens in the group streams. So why not make an own thread to them, right? This is for the Tuesday's group streams, of course, but for more special occasions as well. And what better way to open with than that yesterday's 12 hour stream. And those Tarot cards! Dear Lord, they were so beautifully done and accurately thought out. Amazing job. I am so happy I got this clip. Best moment of the night. Huber's reaction is gold. 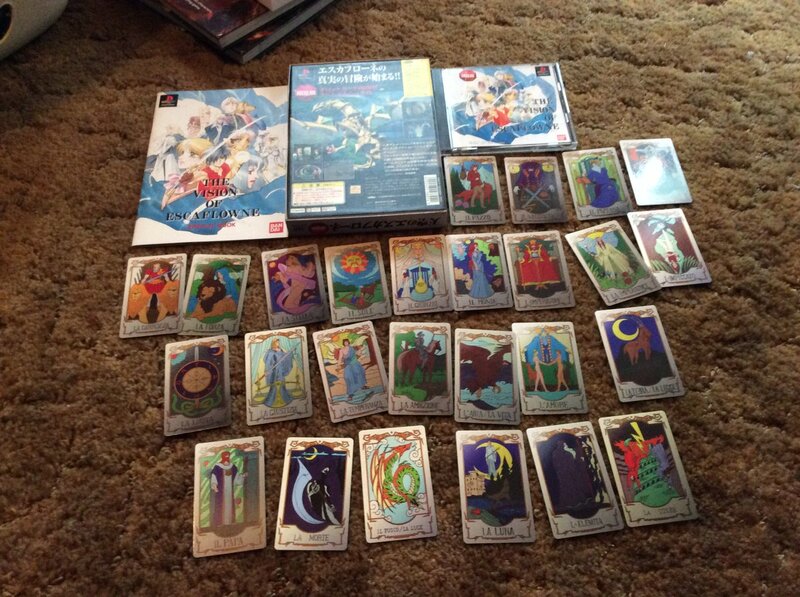 Ian mentioning Escaflowne, and Brandon mentioning his love of tarot, reminded me that I own this little gem! That final gift of the evening had a weird vibe with its "wrapping". I mean, why so demanding with your language? I don't know if that all was supposed to be read in a more joking or lighter manner, but now there was an odd atmosphere for a little while. Kinda like "do as your told, we own you", if exaggerated a little. The gift itself was really cool, and that autograph was an awesome touch. And the wooden box looked pretty wonderful. @Sentinel-Beach I liked the tournament (especially the commentary) but that Snorlax card left a bitter taste in my mouth. Hopefully they'll try the tournament set-up again in the future and someone ensures the cards are a little more fair. The Mario Maker event was pretty great in the end. I think those 30 minutes were just enough time for something like this to make the levels approriately fun and unexpected. It was fun to watch, the whole process. Still, I voted for the Best of the Worst option. Hopefully that idea doesn't die and go away. It doesn't have to happen often, but the way I see it is that it would be basically like Kyle's Dumb Game Mondays but with all the Allies and with three different games. There'd be bewilderment, laughter and raised hands with "I'm done with this". That duel between Ben and Brad didn't work too well because of how unbalanced the starting situation was. I think the gifts DarkKnight sends for stunts like these are a great idea every now and then, but the game choice is pretty critical. And of course it's often hard to know what people know and love or have never tried. The Huber/Brandon duels went well. Now, could've been better. Aah, but we voted for that and all. So there's all that, too. Hmm. Difficult situations, sometimes. @Sentinel-Beach Yeah, having someone who reviewed a game face off against someone who played one match is super lopsided. I love me some Persona but poor Brad didn't really stand a chance. I hope more of these Don streams come, although I'd prefer each member of the team getting an even amount of time to create. This new camera is really good now in the group streams. Was it the second week they used that now, right? A clear improvement. Injustice 2 was fun to watch, and next week's gonna be good: Hall of Greats, part 2! I'm so hyped for the Hall of Greats 2 tonight! I loved the first special; this is going to be hype! Such a nice session again, I just love these guys. :) Lots of bursting laughs, high-level stress and drama in suitable amount. What a night. And that E3 hype in the end was finally the thing that got my hype levels up. We're almost there already! I had this thought since February that what prevents two or more Allies picking the same game for the night and present it then, and apparently, nothing. We could have had three presentations for FFVII, for instance. What a moment that would have been. But I guess Kyle will now come up with something to prevent that from happening. Maybe the easiest thing to do is to just have Kyle know all the games for that night beforehand, so that he can then immediately say to someone that no, that's already taken etc. Is anyone able to shed some light on Kyle's apparent cognitive dissonance from the Hall of the Greats stream? I'm talking about his positive feelings for the story of Link's Awakening and his negative feelings for the story of Bioshock. Both games force you to contemplate your difficult, morally gray "choices" in a story where you technically have no actual choice, yet he praises one for this and rags on the other. What do you guys think? In Link's Awakening you don't have to watch a first-person cutscene where you beat a man to death for no reason. BioShock - The main character doesn't have a choice and the game rubs that in your face in an aggressive manner. Link's Awakening - The main character absolutely has a choice and world begs him not to. It's the player that makes the decision. @Bosman so Links Awakening has multiple endings? Characters in stories make choices but in video games the player can take that action. You don't need multiple endings for there to be choices in a story. @Bosman For a lot of people, that 'twist' in Bioshock served as a sort of wake-up call. A lot of shooters follow similar tropes with a character telling you to do things, sending you waypoints, and you blindly following along because that's how you progress. What led to a lot of people finding this as an "A-ha!" moment is the subversion of why you were doing any of this - sure, you wanted to complete the game but the game was demanding things of you, things that you gleefully did. Now, do I think the game wags its finger in your face a little too much? Absolutely. The whole second half of the game basically falls apart at points and the message itself becomes muddy. Even so, this was a gaming moment that made a lot of people think about intentions instead of just following orders. The disconnect I believe the others are talking about is that to complete Link's Awakening, you have to make the choice to wake the wind fish. It could be argued that you could just hang around in that world and not destroy it, but nothing changes and it just remains stagnant. To progress, you must kill Nightmares. To progress in Bioshock, you must kill Andrew Ryan. I agree that it's strange that scenario is a cutscene though, especially when Ken Levine speaks out so adamantly against taking away player control and tries to avoid cutscenes wherever possible. In all honesty, I feel Undertale tackles these issues with much more grace than Bioshock or Link's Awakening combined. Sweet Lord, I've been loving these super long E3 streams! :) Especially when the night starts getting late, like now the final moments of the second day. Damiani falling asleep on his chair and everyone just having an absolute blast. What a moment, and then that FFXIV tease still. :D Also the live podcast was just insane in a good way, Huber and Ben all red all the time trying not to laugh on the bench. :) Thank you guys, this has been really entertaining to watch. And one final night still to go! But what the F-bomb? Easy Livin'. Is that seriously a 50 hour stream from a beach house? :D Insanity! I mean that's some reality TV level stuff already. That stream will just destroy some EZA fans who try to watch it all, that's unsafe. But what a cool idea, there'll be some instant classic moments coming up. What's the story that huber stole from jones? @A7X458 Huber had talked with Jones, and Jones had told him about how Amanda had suddenly in the middle of the night asked him what's Chim? :) And Huber told us this (on Day 2 Recap?) before Brandon did.